The Antarctic Peninsula is one of the fastest warming spots on the planet, but in recent days, a stubborn weather pattern sent temperatures skyrocketing there, setting a record high for the continent. 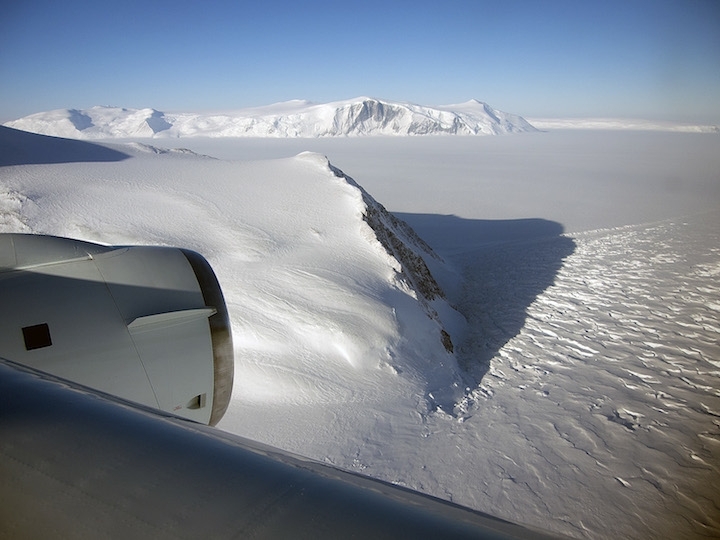 An airplane view of the eastern side of the Antarctica Peninsula. While the event that set the mercury soaring — called a Chinook, or foehn wind — isn’t unusual for the region, it does seem to be increasing with climate change, as winds around Antarctica become stronger. Scientists are worried that if these sudden warming events become more common or more intense, they could put the already threatened ice of the peninsula in an even more precarious situation, with serious implications for global sea level rise. The peninsula of Antarctica is a slender arm of land that reaches out from the continent toward South America. It has warmed by about 5°F in the past 50 years, while the globe as a whole has warmed about 1.3°F. 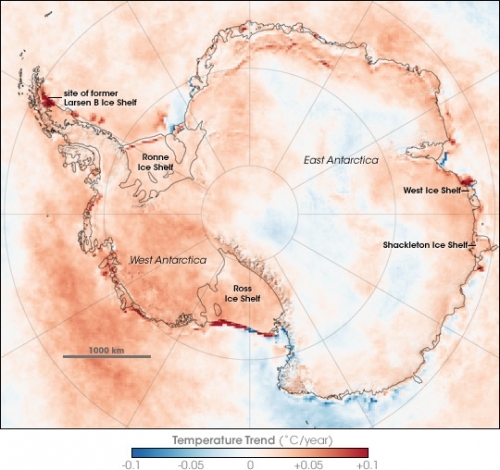 All that warmth has caused major changes to the peninsula, from the precipitous decline of penguin colonies to the spectacular collapse of two of the ice shelves on its fringe. Those floating platforms of ice buttress the land-bound glaciers behind them, controlling how quickly that ice flows into the sea, and its potential contributions to sea level rise. During last week’s event, the temperature at Argentina’s Esperanza Base, near the peninsula’s tip, hit 17.5°C (about 63.5°F), a record for the continent. It was a few tenths of a degree higher than the previous record, also set at Esperanza, on April 24, 1961. A network of sensors further to the south also saw temperatures jump from about 15°F to 55°F “very quickly and for a period of several days, which was quite unusual,” Ted Scambos, a glaciologist with the National Snow and Ice Data Center in Boulder, Colo., said. That sudden spike was due to warm air washing over the area in what in the western U.S. is called a Chinook wind event, but elsewhere is known as a foehn wind. During such an event, warm air at a high altitude warms further still as it descends the leeward side of a mountain. In this case, the large differences between a high pressure system situated between the Antarctic Peninsula and South America and a low pressure area over the main part of Antarctica caused strong winds to blow warm air over the peninsula from the northwest. Because the peninsula is a long mountain chain, that air warmed even more as it descended the eastern, leeward side of the spit of land. Intense Chinook events have been seen before on the peninsula and “are really the triggers” that lead to major melting events, Scambos said. The relatively hot, dry air causes snow on the ice surface to evaporate and melt ponds to form. That water can trickle down into cracks where it exerts enough pressure to fracture the ice. Long-term trends in yearly surface temperatures across Antarctica from 1981-2007. That precedent makes Scambos and others worried about the fate of the remaining ice shelves of the peninsula. Adding to those worries is research, done in part by the British Antarctic Survey, that suggests Chinook events could become more common or more intense at the peninsula as the westerly winds that whip around the continent intensify, possibly because of climate change. “No doubt about it, that’s part of it,” Scambos said. Scambos and John King, a British Antarctic Survey researcher involved in that study, both cautioned against pinning this specific event on climate change, because they do happen normally. But “the recent record temperatures observed in this region do provide a vivid illustration of the impact of foehn winds on the regional climate,” King said. Satellites showed that melt ponds formed in the ice along the eastern peninsula after the temperature spike, including on the sea ice that has taken over the spots where the collapsed ice shelves once were. That sea ice is helping to prop up the ice shelves that remain, Scambos said. The melt, though, wasn’t as widespread or damaging as it might have been because of overall cooler temperatures in Antarctica his year, he said. But, as Scambos added, while this Chinook wind didn’t cause major damage to the ice shelves, eventually one will.